Note: 2017 values based on production through June 23. 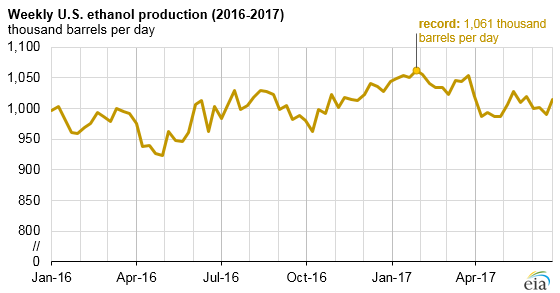 Through the first six months of 2017, U.S. weekly ethanol production averaged 1.02 million barrels per day (b/d), an increase of 5% over the same period in 2016. On a weekly basis, U.S. ethanol production set a record of 1.06 million b/d in the week of January 27, 2017, and it has averaged near or above 1 million b/d in every week of 2017 except for a few weeks in April, when ethanol plants typically undergo seasonal maintenance. If ethanol production remains relatively high through the second half of the year, as EIA’s Short-Term Energy Outlook (STEO) expects, 2017 will set a new record for annual fuel ethanol production. Corn is the primary feedstock of ethanol in the United States, and large corn harvests have contributed to increased ethanol production in recent years. The U.S. Department of Agriculture estimates that the United States produced a record 15.1 billion bushels of corn in the 2016–17 harvest year, 11% more than the 2015–16 harvest. Increased corn production and relatively stable corn prices have helped make increased ethanol production more profitable and less susceptible to corn price shocks that had affected ethanol profitability and output in the past. U.S. ethanol plant capacity increased for the fourth consecutive year in 2017, reaching a nameplate capacity of approximately 15.5 billion gallons per year in January. Total ethanol production is expected to reach 1.02 million barrels per day in 2017, a rate equivalent to 15.8 billion gallons. Annual ethanol production is able to exceed capacity for two reasons: new production capacity has likely been added since the January 2017 capacity survey date, and many ethanol plants are able to operate at levels beyond their nameplate production capacity. In the United States, ethanol is primarily used as a blending component in the production of motor gasoline and mainly blended in volumes up to 10% ethanol, also known as E10. In recent years, ethanol production increased as a result of higher Renewable Fuel Standard (RFS) targets and growth in domestic motor gasoline consumption, almost all of which is now blended with 10% ethanol by volume. Demand for higher ethanol blends such as E15 and E85 remains limited. U.S. motor gasoline consumption has grown the past four years, increasing from 8.7 million b/d in 2012 to 9.3 million b/d in 2016, resulting in an increase of 7% in additional ethanol demand by way of E10 blending that has helped to support consistent growth in ethanol production over the same period. Exports of ethanol have also been increasing. Through the first four months of 2017, U.S. gross ethanol exports have averaged 96,000 barrels per day—40% higher than exports during the same period in 2016—and the highest level on record for that period of the year. 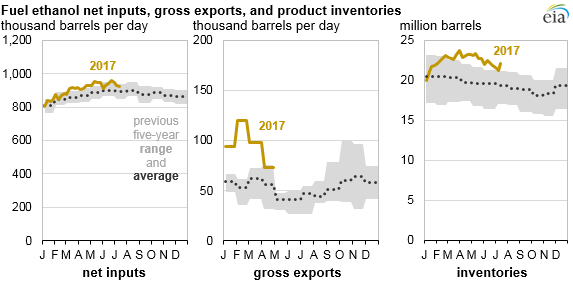 In its latest Short-Term Energy Outlook, EIA forecasts that U.S. ethanol net exports will reach nearly 80,000 b/d in 2017, likely surpassing the previous record of 70,000 b/d set in 2011. Through the first half of 2017, increasing ethanol production rates have outpaced domestic E10 gasoline demand and export growth, leading to elevated ethanol inventory levels at a time when they are typically falling to meet peak driving demand. As of July 14, 2017, weekly ending stocks of ethanol reached 22.1 million barrels, 5% higher than the same time last year and 13% higher than the previous five-year average. Ethanol inventories reached a record level of 23.7 million barrels for the week ending March 31, 2017.